combined with a Firewall module, giving you full control of your system. SpyShelter does not rely on an antivirus signature database, because our software understands how malware works. SpyShelter protects you from both known and uknown threats, which were not discovered by antivirus labs yet. SpyShelter’s Graphic User Interface(GUI) design allows for a quick access to all of the application’s unique features and settings. Fast algorithm processing does not slow down your computer while scanning for dangerous elements. In fact, SpyShelter’s proactive defense is so light, that you will not experience any difference in your PC performance. SpyShelter Firewall provides incoming and outgoing network requests detection, allowing you control every inbound and outbound connection that is being established. This feature locks out hackers from connecting to your PC, and stops undesired applications from connecting to the internet. User and machine awareness balances security with business needs by enabling granular policy definitions per user and group. Spyshelter Firewall allows network administrators to securely control access to clients, servers and applications, with detailed insights into the users, groups, applications, machines and connection types. Spyshelter Firewall has built-in support for creating Internet Protocol version 6 (IPv6) objects and using them in your rules. physical memory (RAM) and other sensitive computer parts along with processes, so that malicious code cannot be injected to take control of your PC. SpyShelter shields sensitive data that can be found in your Windows clipboard as a result of copying, cutting, and pasting. Spyshelter ensures that this information will not be maliciously monitored by other people. World’s first unique security module that protects your system against VOIP sound trojan loggers. This proves to be useful when you use instant messengers for voice calls. This module also protects you against capturing sound from your webcam or built-in microphone. Webcam loggers record video or take pictures using your webcam and send them across the Internet. SpyShelter’s Webcam Protection module will keep your camera safe. SpyShelter AntiNetworkSpy proactive module prevents dangerous trojans from stealing your private informations, while making important SSL internet transactions. It also blocks HTTP/HTTPS trojans on user level as well as POP, SMTP, FTP, loggers. 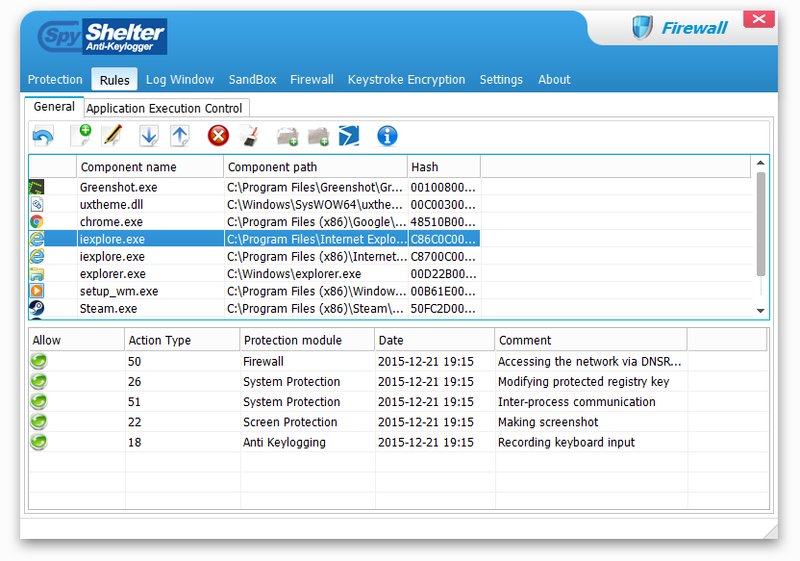 SpyShelter has an integrated keystroke encryption driver, which encrypts all of your keystrokes in real time. This means that even if you allow any malicious application to run on your system, it will only retrieve meaningless random text. SpyShelter’s built in special Restricted Apps module allows you to restrict access of chosen applications to system resources. It increases chances of blocking attacks launched through holes in applications and limits access for actions like recording keyboard input, shatter attacks, and more. Afraid of viruses? SpyShelter allows you to perform a quick online scan of any suspicious files using multiple antivirus programs at the same time, with just one mouse click! It is now also possible to configure external file scanner. Every single thing that is connected to World Wide Web needs a firewall. Whether you are an individual hoping to secure your bank account information or a large business owner that has client documentation to protect, they give us the ability to safely conduct our day to day business without having to worry about information getting hijacked or corrupted. Firewalls are the critical component in keeping us safe in today’s information world. If you feel that your personal or business data might get compromised, then get SpyShelter Firewall today and start to protect your privacy. SpyShelter Firewall protection will lock out all intruders, and on top of that – it includes all the features of World’s best anti keylogger – SpyShelter Premium. 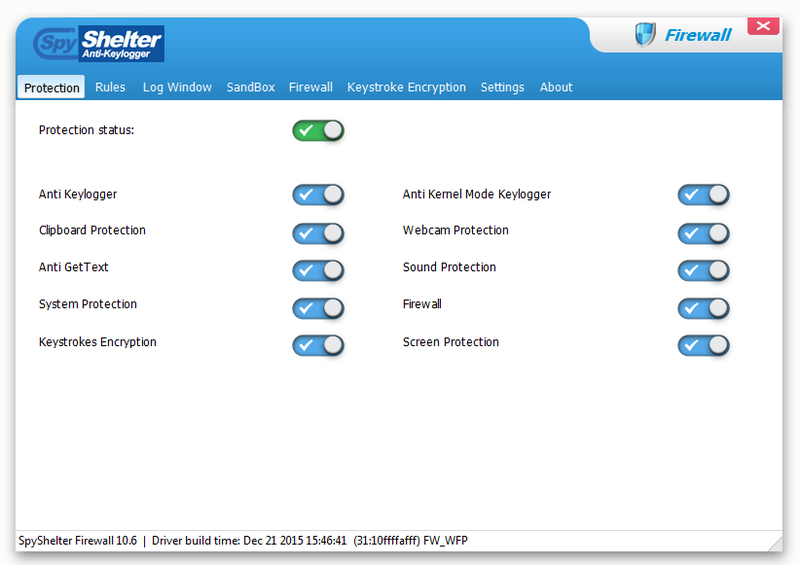 Our software offers a long list of features which were developed to protect your private information. Except all the modules of SpyShelter Premium, SpyShelter Firewall offers such unique features like High quality DDE requests catching, Important COM objects protection, Extended registry protection and Extended Inter-Process communication protection. SpyShelter Firewall monitors susceptible and weak spots in your computer system, in order to ensure that even the most advanced logging malware is shut down before it can launch a single dangerous attack against your computer. Amazing features packaged in SpyShelter Firewall will protect your privacy against all cyber threats. Increase your overall PC system protection against rootkits now, and surf the web without fear of being watched. Starting from 35€ a year. Full license to use the software beyond the 14-day evaluation. Unlimited updates to all new versions. No Nag screen, No Delays on program execution. Free reissue of the lost license key.